Palace Residences ... boutique waterfront living. 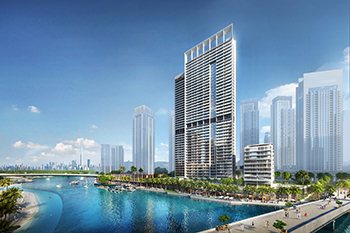 Emaar has launched Palace Residences, a five-star waterfront branded residence development, within its 6-sq-km mega-development, Dubai Creek Harbour, described as ‘The World of Tomorrow’. Palace Residences by Address Hotels + Resorts is being designed for boutique waterfront living that offers the residents spectacular views of the Dubai Creek Harbour. The residences are only steps away from two flourishing waterfront destinations – Creek Marina with a vibrant promenade and the Creek Beach. Located on the promenade, the homes offer unobstructed views of the iconic Dubai Creek Tower and Ras Al Khor Wildlife Sanctuary. They are also within walking distance of Dubai Square, the retail metropolis of the future, says Emaar. Palace Residences comprises branded one- to four-bedroom apartments serviced on demand by Address Hotels + Resorts, the award-winning premium luxury hotel and resorts brand. Assuring investors significant return on investment (ROI), Palace Residences is the first launch in Dubai Creek Harbour in 2019. Investors will have several benefits including five-year property management services by Emaar, 50 per cent discount on membership at the Palace Dubai Creek Harbour Spa and pool, as well as 25 per cent discount on food and beverage at the hotel’s outlets, states the Dubai developer. Palace Residences is located adjacent to the upcoming 121-room Palace Dubai Creek Harbour hotel featuring a range of dining choices and luxury hotel services. An architectural landmark, Palace Dubai Creek Harbour and Palace Residences are housed in two contemporary 44-storey towers rising above the Creek Canal and Creek Beach. Residents will have access to a host of exclusive amenities in both the residential towers and the hotel. These include a rooftop infinity edge swimming pool, signature rooftop lounge and grill, a full-fledged gymnasium, 24x7 concierge service and valet parking. Over 5,000 residents are set to move in to their homes in Creek Marina this year, with over 12,750 residents to move in next year.